This Halloween, you do not need a big budget horror film to get your fear fix in North Texas. 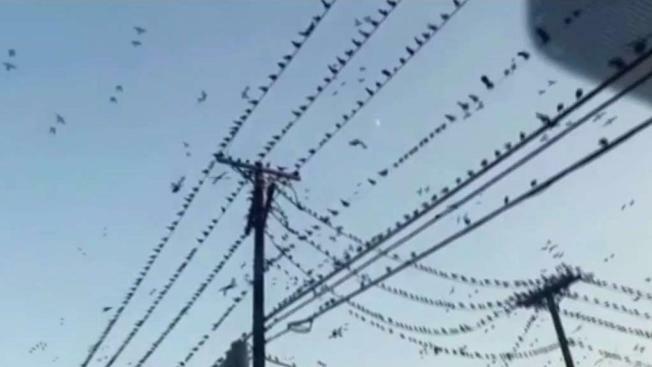 The sound of thousands of birds massed together in a grocery store parking lot — perched on cars, hopping along the ground and fluttering from tree to tree — is enough to send shivers down the spine of even the toughest Texan. Grackles are back in full force this fall, as tends to happen in Texas. And the people of Dallas-Fort Worth have noticed. “It’s positively ‘Hitchcockian’ in the evening!” noted JoAnne Kamman about the Kroger where she shops in Flower Mound, at Cross Timbers and 2499. “We have to run and dodge them and their poop — bad, bad, bad!” Alysha Singleton exclaimed about the grackles she encounters at the L.A. Fitness at Little Road in Arlington. “When they roost, it’s freaky,” Jo Hoffart noted about the grackles she sees at the Red Oak Walmart. Longtime residents might balk at the hubbub, but remember, approximately 1,000 new people move to Texas every single day. There are several species of grackle — the iridescent black and purple Great-tailed Grackle might be the most recognizable — and all of them are native to this region. Their numbers grow during the fall migration. And the grackles are most noticeable around dusk and dawn. One place where the grackles, whose numbers are counted in the millions across Texas and the American Southwest, are not likely to be spotted is in downtown Fort Worth. The area around Sundance Square is patrolled around dawn and dusk by contractors, hired by Downtown Fort Worth, Inc., whose sole responsibility is to clear the area of grackles. The staff of Texas Bird Services employs several tactics to keep the grackles away: laser pointers, noisemakers, even professional falconers, whose large birds of prey are brought in thanks to a special permit granted by the U.S. Fish and Wildlife Service. "Operation: Grackle," as this effort has been called, has been recognized as a model program to rid an urban area of the pesky blackbirds. In 2013, the International Downtown Association awarded Downtown Fort Worth, Inc. (DFWI) a Pinnacle Award for ‘Operation: Grackle,’ according to a news release.